Last month I quipped on this blog that "Pfizer's Social Media Initiatives are Getting Old." Actually, that was a review of Pfizer's new "Get Old" initiative, which Pfizer says is a "first-of-its-kind online community" where people can "get and share information, add to the dialogue and contribute to the growing body of knowledge about this important topic." In that post, I suggested that Pfizer's real goal was to court advocacy groups such as the Alzheimer’s Association in advance of the announcement of results from an Alzheimer clinical trial of its drug designed to treat the disease. 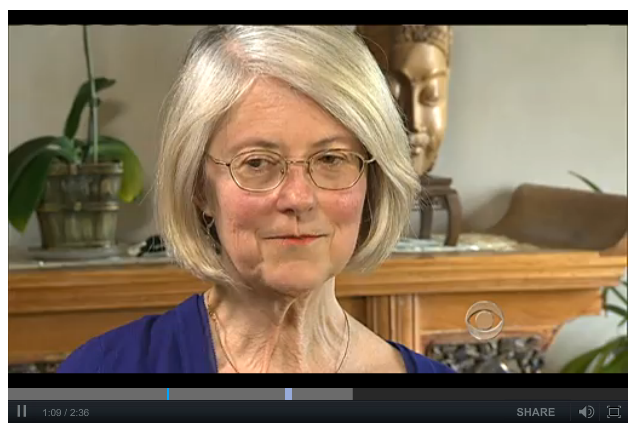 Just a couple of days ago, on the CBS Evening News, I saw an interview of Rae Lyn Burke, "An Alzheimer's researcher who is also a patient." Ms. Burke is participating in a clinical trial of bapineuzumab (bap-ih-NOOZ-uh-mab), a drug with a funny, Irani-sounding name. Turns out that bapineuzumab is a Pfizer/Johnson and Johnson drug. Ms. Burke's participation in an Alzheimer clinical trial is old news. According to an August, 2011, San Francisco Chronicle story (here), "Burke worked on some of the initial research into bapineuzumab" (her LinkedIn profile indicates that she is "senior Director at SRI International," a CRO that is likely running the Pfizer Alzheimer clinical trial). The 2011 story also revealed that "Burke has been in the trial for almost two years, and should find out shortly whether she's been receiving the active drug or a placebo. If she's on the placebo, she intends to switch to the active drug as soon as possible. She obviously was in the bapineuzumab arm of the study, or switched, because in her recent CBS interview she said that she taking the drug and it was "slowing the decline, but I don't think it's making me better." That's too bad. Is this all part of Pfizer's multichannel marketing of bapineuzumab prior to its approval by the FDA (if indeed it ever does get approval)? It's no coincidence that Burke's story was resurrected shortly before results from key studies of two Alzheimer's drugs -- including bapineuzumab -- are to be released. But the journalism stinks: the CBS Evening News story is practically the same, word-for-word as the 2011 San Francisco Chronicle piece cited above. Maybe CBS owns the San Francisco Chronicle or maybe it's becoming more like a blog rather than a primary source of news. There are also stories in newspapers about these trials, such as this one from the Mercury News: "Alzheimer's drugs could be pharmaceutical industry's last-gasp efforts to cure disease" and this one from the Denver post: "Alzheimer's cure may lie in three drug (sic) tested over past decade." Both of these stories are based on the same AP story, which does NOT mention "cure" but says the drugs are meant to "slow the course of Alzheimer's disease." I always find it odd that reporters often overstate the efficacy of drugs, sometimes in collusion with drug companies (see, for, example, "BI Masters the Art of WOM through Its 'Parrots,' er, Spokespersons"). Perhaps the local news reporters were influenced to use the word "cure" by Pfizer, JNJ, Lilly, and/or Baxter PR parrot trainers? As I mentioned in my "Get Old" post, institutional investors doubt that treatments for Alzheimer's disease being developed by Pfizer (and Lilly) will "achieve the main goals of their ongoing late-stage trials." Those goals certainly are NOT to CURE Alzheimer's, but only "aim to clear the sticky plaque gumming up patients' brains." "Everybody in the field is probably holding their breath that there is something positive to come out of these trials," said Dr. Ronald Petersen, director of the Mayo Clinic's Alzheimer's Disease Research Center. "It may not be a home run" in terms of improving memory and cognition, but if brain imaging or spinal fluid tests show the drugs are hitting their target, "they will be regarded as successes," he said. Next week, at the 4th Annual Social Communications & Healthcare: Case Studies and Roundtables confernce in NYC, I hope to discuss this with Pfizer's Andrew Topen (VP of Global Media Relations and Digital Communications), Caroline Roan (VP of Corporate Responsibility and Reputation), and/or Bob Libbey (Senior Director of Global Colleague Communications). These exceutives led the GetOld.com site project and will present the Get Old Case study ("Pfizer Starts a Conversation about Aging") at the conference. NOTE: Pharma Marketing News is aMedia Partner for this conference. You can get a $20 discount off registration if you have the secret word, which you can find here.